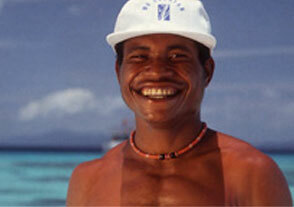 Tawali is located in a secluded area of Milne Bay amongst local fishing villages and accessible only by boat. Built on a limestone bluff eighty feet above the water, Tawali offers guests a private retreat in which to enjoy the wonders of PNG. Tawali was constructed by local craftsmen and you will find beautifully carved totems and woodwork in the spacious main lodge and throughout the resort. Some of these works of art took two years to complete and are unique to the Milne Bay culture. Covered walkways connect guest bungalows, which are complete with private balconies overlooking Hoia Bay. The air-conditioned bungalows are spacious with two queen beds and rosewood interiors that include desks, closets and lounge areas. Each room has a personal safe and coffee making facilities. Bathrooms are modern, completely tiled and have solar heated water. Tucked away, only accessible by boat, sits what may be Papua New Guinea’s best kept scuba diving secret – Tawali Resort. Welcome to the exotic culture of Papua New Guinea (PNG) and to Tawali Resort. Located on a volcanic bluff overlooking the clear protected waters of Milne Bay, Tawali offers travelers a unique location to dive, relax and enjoy the unspoiled wonders of this magnificent part of the world. Learn what it really means to step back in time where the worries of the world fade and the magic of nature unfolds. 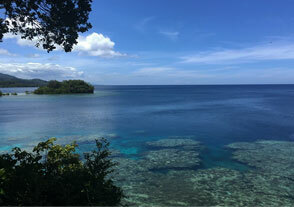 Tawali is located in a secluded area of Milne Bay amongst local fishing villages and accessible only by boat. Built on a limestone bluff eighty feet above the water, Tawali offers guests a private retreat in which to enjoy the wonders of PNG. Tawali was constructed by local craftsmen and you will find beautifully carved totems and woodwork in the spacious main lodge and throughout the resort. Learn what it really means to step back in time where the worries of the world fade and the magic of nature unfolds. Some of these works of art took two years to complete and are unique to the Milne Bay culture. Covered walkways connect guest bungalows, which are complete with private balconies overlooking Hoia Bay. The air-conditioned bungalows are spacious with two queen beds and rosewood interiors that include desks, closets and lounge areas. Each room has a personal safe and coffee making facilities. Bathrooms are modern, completely tiled and have solar heated water. Since there never has been electricity in this remote location until Tawali was completed, all the woodwork from framing to finished wood floors was done completely with out the help of power tools. Every board that needed to be cut, every carving and most of the furniture was built on sight by hand. This project has been a great boost for the local workers. Villagers who had never before been able to have jobs were trained by more experienced carpenters so that when Tawali was completed they had new skills to help them get better paying jobs. Papua New Guinea lies south of the equator and north of Australia. It’s the last of a string of islands spilling down from South-East Asia into the Pacific, and comprises the eastern half of the island of New Guinea and a collection of surrounding islands. The country is dominated by a central spine of mountains, the Owen Stanley Range, with many peaks over 4000m ( 13,120ft). There are close to 9000 species of plants in PNG, most of them found in the lowland rain forests. Around 250 species of mammals live in the islands, mostly bats and rats, but also including marsupials such as the tree kangaroo. There are also two kinds of echidnas (spiny anteaters). The real treat however is the 700 species of birds. There are more parrot, pigeon, and kingfisher species – from huge crowned pigeons to delicate pygmy parrots – than anywhere else in the world. Other notable birds are giant cassowaries, kokomos (hornbills) and cockatoos. Papua New Guinea has only four national parks, including Varirata National Park and McAdam National Park, but more have been proposed. The major problems facing the environment and its flora and fauna are logging and heavy-metal pollution from copper mines such as Panguna on Bougainville Island (currently closed) and Ok Tedi in the Star Mountains.